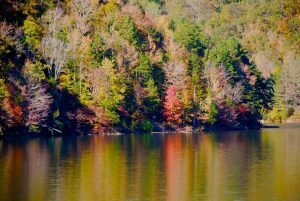 Henderson Tourist Commission – Cozy Cabins, Camping, and Cider! Henderson Tourist Commission / activities / Cozy Cabins, Camping, and Cider! Cozy Cabins, Camping, and Cider! When fall rolls around everyone has items on their to do list. Pumpkin patches, corn mazes, haunted houses, hayrides, and bonfires… On our to do list year is a gem that some people may overlook – John James Audubon State Park Cabin rentals! Fall is the optimal time to plan a stay-cation to John James Audubon State Park, who doesn’t want to curl up in a cozy cottage setting and sip on hot coco by a crackling fireplace? 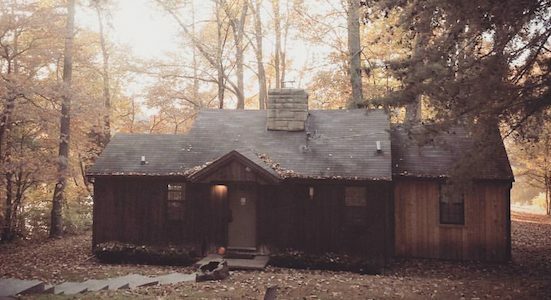 Even if you live in Henderson County and you want a change of scenery for the weekend, Audubon cabins are the perfect choice. All 6 cabins are located in a cul-de-sac overlooking Recreation Lake. Imagine warm glowing sunsets behind red, orange, and yellow leaves, reflecting off of the serine lake. All cottages are equipped with a full size kitchen as well as basic cooking and eating utensils. Weather this time of year is also great for grilling out, and the easy access grills are great for s’mores off the back porch. Staying at Audubon’s cottages in the fall means morning walks and evening walks are going to feel phenomenal. Crisp cool breeze, the soft crunch of leaves under your feet, vibrant colors, bird watching (cardinals, chickadees, tufted titmouse, downy woodpeckers, nuthatch, gold finch, etc). After a cool evening of enjoying the sunset and the surrounding nature, or after an evening of hiking or visiting the museum and nature center, your cozy cottage will be awaiting. Curl up with a blanket, a cup of hot cocoa or warm cider and relax. Each cottage features a TV with cable in the living room and bedroom(s). The 5 one bedroom cottages include a large stone fireplace to make everything feel more homey. Play cards with friends, maybe plan an acoustic music session by the lake, search for wildlife among the many winding networks of trails, take family pictures in the fall scenery, and escape from reality into nature’s bliss. If you have your own camper, Audubon State Park also offers campgrounds with showers and restrooms, picnic tables, grills and a playground. Fall only comes around once a year and this 70 degree weather isn’t going to last all year so take advantage of the best camping season. The leaves are changing colors, click here to reserve your weekend in an Audubon Cabin!